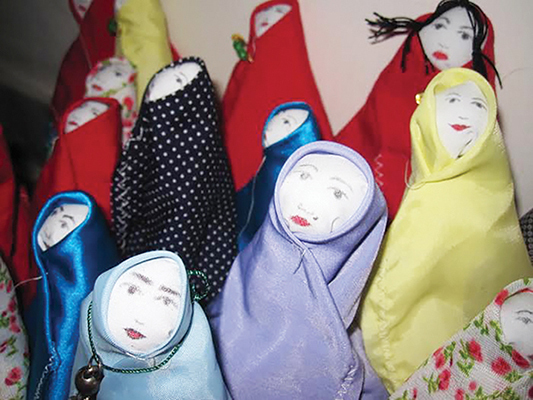 By making and selling such handicrafts as folklore dolls, the girls deprived of education in southeastern Iran welcome the Persian New Year. Girls from Sistan and Baluchestan province in southeastern Iran are willing to use “Lo’batak”, the famous folklore doll of this region, as a symbol of girls who have been deprived of education; a symbol to stop early marriages. According to a Farsi report by Vaghaye Ettefaghieh newspaper, the majority of girls in Sistan have heard the tale of Lo’batak, the doll from Sistan. “Their mothers told them her tale when they were little,” explained Sama, one of these girls who dropped out of primary school after just two years, before telling a Cinderella-like tale about a little girl tyrannized by her step-mother who then marries a prince and lives happily afterward. Instead of sitting on a golden throne, however, this girl from a deprived village near Zabol wishes other things. “We make Lo’batak dolls using stitched pieces of cheap clothes, then stick them on pencils,” said the 18-year-old Sama, expressing that the beloved Lo’batak symbolises the ambitions of village girls. Alongside other girls from the villages of Zabol, she is one of the thousands of school dropout children who live in Sistan and Baluchestan, and now want to open the closed doors of schools to themselves on the verge of Persian New Year by making handicrafts and designing colourful fabrics. Since a few months ago, a group of female household heads and school dropout girls from villages near Zabol are designing and making dolls, coloured fabrics and ceramic bowls with minimum facilities. Other than earning a living, they try to warn Iranian people and authorities about the risks of early marriage for the girls who are deprived of education. “In fact, it is just a way to show one’s personal talents,” noted Zohreh Sayyadi, a child rights activist. “The work somehow empowers the education-deprived girls,” she noted, referring to the artistic activities these girls do to develop their talents and abilities: it prevents early marriages, and provides for further education.